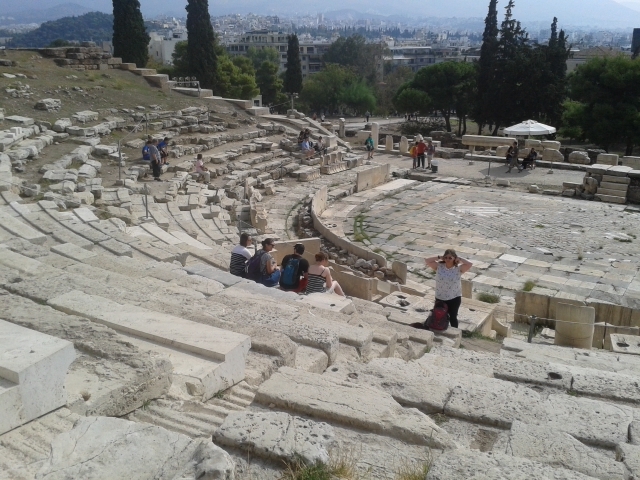 Theatre of Dionysus Eleuthereus is located on the southern slope of The Acropolis. Written by Paul Mason and James Quinn, directed by James Quinn, Party Animals is a brilliant political satire on the Blairites and coup plotters within the Labour Party. Sound quality is a bit iffy, listen on headphones. ¡Increíble anoche en Teatro Timanfaya! I am lost for words. 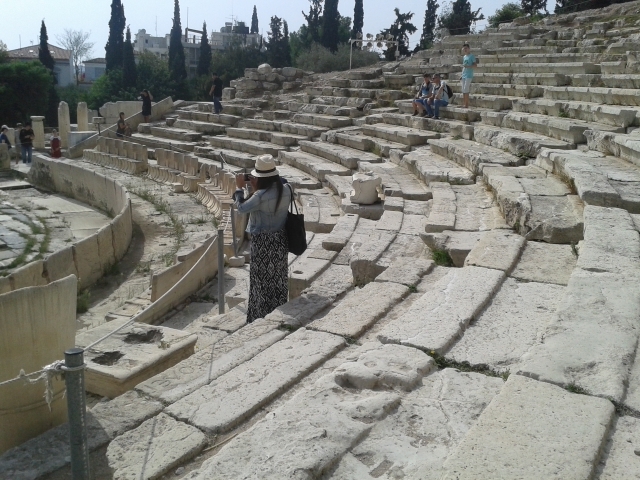 The audience were transfixed. A man walks on in the darkness, sharpening a knife on a grindstone, squeak, squeak. He is joined by two women either side, washing clothes in a tub, slap, slap, a rhythm is built up, musicians join in, one of the women breaks into song. Three incredible vocalists, guys on percussion, guy on double bass, guy on cello, another guy on keyboard. Percussion three large drums, to which we were treated to amazing drumming session, seeds, banging in a tub and hollowed out tree trunk. Music appears to be Arabic, slowly changes, at times jazz, at the end, African, if they could, the audience would have been on their feet dancing. Based upon traditional work in the Canary Islands, and set to a back drop of ever changing Canarians carrying out their traditional work. We were even treated to the whistle used to communicate, as travels further than voice in the mountains. Congratulations to the artistic director, to the musicians, the sound engineer, the lighting engineer, and the theatre director Monica for hosting this amazing musical spectacular. 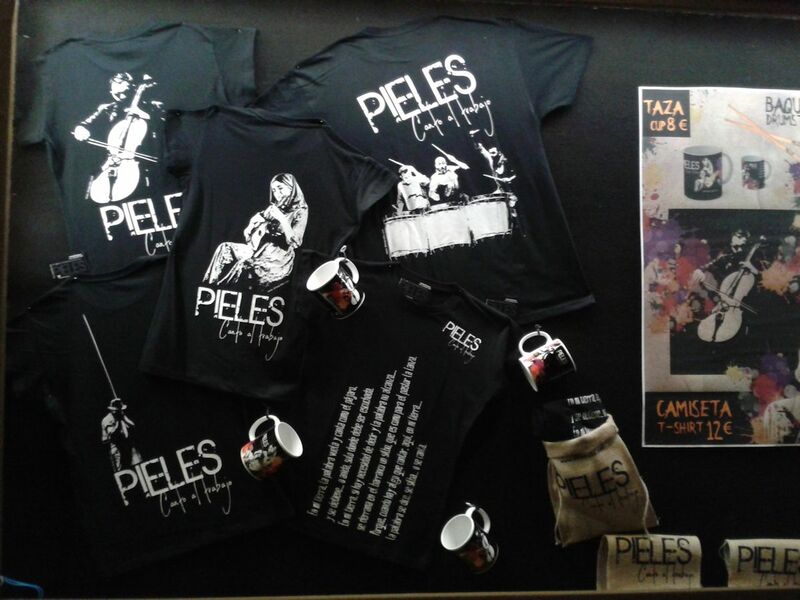 Pieles, a must see Wednesday night at Teatro Timanfaya. Why do the hotels promote tourist crap as so-called entertainment, when there are cultural events worth attending? Pieles is not available on DVD or youtube or vimeo, simply because it is a musical spectacular that must be seen live. There is the possibility the music may be uploaded to bandcamp and available on CD. A neat touch, the musicians lined up to greet as people left the auditorium. Inspector Chen, a character I had never heard of. A series of novels, set in Shanghai, in the immediate aftermath of Tiananmen Square massacre. A China that is changing, from the China of Chairman Mao, to the China we see of today. Inspector Chen is an unusual character. He is a poet and there are many references to early Chinese poetry. He studied English at university, was hoping to go on to a Masters Degree, but is ordered to take up a post as a diplomat, until it is found his uncle had unrevolutionary tendencies. He is transferred to the Shanghai Police to write reports for the local Party Secretary. He asks to be assigned to police work, and is assigned to special cases, political cases, given his own apartment, this at a time when three generations of a family are all living in one apartment. Each person encountered is politely addressed by their title, or as Comrade. A wonderful insight into China. Qiu Xiaolong (1953- ) was born Shanghai, China. Visiting the United States in 1988 to write a book about T S Eliot, but following the Tiananmen Square protests of 1989, and a newspaper reporting on his previous fundraising efforts for Chinese students, he was forced to remain in America to avoid persecution by the Chinese Communist Party. BBC Radio 4 has dramatised three of the Inspector Chen novels. Framed for the murder of a corrupt Police Commissioner, police inspector Alia Khan is released from prison when CCTV footage shows she did not kill the man. On her release from jail, Alia Khan seeks a life of obscurity as a receptionist in a run down Mumbai hotel. But murder soon comes knocking at her door. She receives flowers, with a card with a message with a woman with her hair standing on end. This leads Alia Khan to the roof of the hotel, a woman is found hanging upside down, she is dead, having been tortured. Alia Khan then realises the card shows the woman hanging upside down her hair is not standing on end. Recorded on location in Mumbai. There is a lot of background noise. Listening with headphones is recommended. 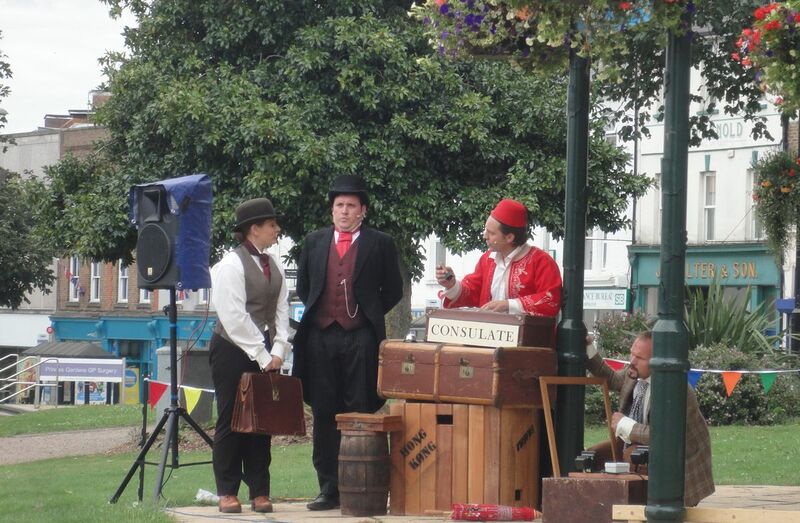 A theatrical performance of Around the World in 80 Days in the park with the bandstand, part of Celebrating Aldershot (not that there is anything to celebrate). Hobo Co with their battered old Citroen van serving quality coffee. Surprisingly the park was packed. I only regret I was passing through, as it was a good performance. There were programmes, but I neglected to pick one up, and therefore I regret to say I do not know who the performers were. What Around the World in 80 Days shows, if you make the effort to put on quality, it will bring people in. A lesson the dysfunctional council has yet to learn. 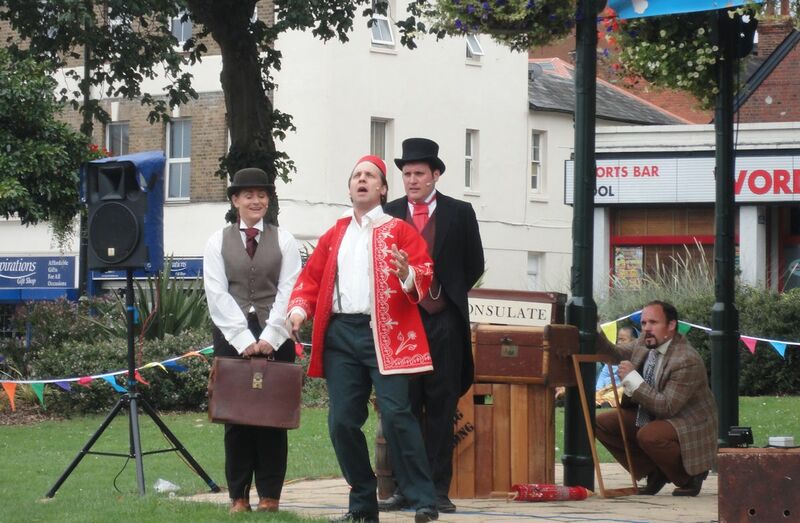 I have been thinking add theatre to Staycation Live in Godalming. Around the World in 80 Days reinforces it would be a good idea.